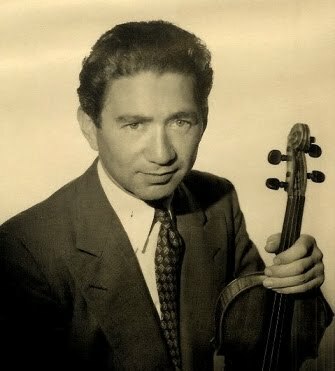 Henri Temianka was a Polish violinist, conductor, author, and teacher born on November 19, 1906 (Heifetz was 5 years old.) His teachers were Carel Blitz (1915-1923) in Holland; Willy Hess (1923-1924) in Berlin, Germany; Jules Boucherit (1924-1926) in Paris, France; and Carl Flesch at the Curtis Institute of Music in Philadelphia. He graduated from the Curtis Institute in 1930. However, he actually made his New York debut in 1928, prior to graduation and subsequently started touring Europe, Russia, and the U.S. Upon entering the Wieniawski Competition in 1935, he took a third prize, behind David Oistrakh (second prize), and Ginette Neveu, who later died in a plane crash at a very young age. In 1936, he founded the Temianka Chamber Orchestra in London. In 1937, he became concertmaster of the Scottish Orchestra (he was born in Scotland.) In 1941, he served as concertmaster of the Pittsburg Symphony. Then, the Second World War interrupted his career but he served as a translator for the armed services because he was fluent in four languages. Thereafter, he resumed his concertizing and eventually played in over 30 countries. In 1946, as first violinist, he founded the Paganini String Quartet. The quartet's life span was twenty years (1946-1966.) He also gave lectures, held master classes, taught for short periods at many universities around the world, and wrote articles for many periodicals. In 1960, he founded, as conductor, the California Chamber Symphony based at UCLA (USA.) Temianka was one of the first - if not the very first - to give pre-concert talks to his audiences - a common practice nowadays. He also famously said: "There are three fool-proof ways to avoid criticism - say nothing, do nothing, and be nothing." He wrote two autobiographical books: Facing the Music and Chance Encounters. Among the violins he played were a Gagliano, a 1727 Stradivarius (the Salabue), and a 1687 Guarneri. Temianka died on November 7, 1992, at age 85.